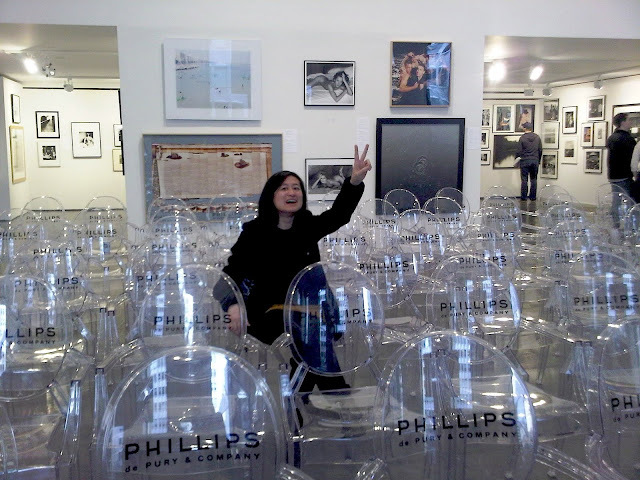 Today, I discovered yet another "best thing in Manhattan life you can do for free" - go to a contemporary art auction. Truly, it's like going to "the game." "Amazing photos, we gotta go!" texted my fellow School of Visual Arts cohort Lisa, who'd downloaded the iPhone app of über-chic auction house Phillips de Pury. The app allows you to browse the "lots" - auction-speak for artwork - and seemingly, do everything short of bid on your phone. 'Cos you wouldn't want to wave it around and accidentally swipe an extra 5 grand onto your cellphone bill, now would you?